Recently, the FDA warned against the use of homeopathic teething tablets and gels. These products, the agency said, can pose a health risk to children. Consumers were told to seek medical care if their child experienced seizures, difficulty breathing, or other adverse effects after using homeopathic teething tablets or gels. Since then, the FDA has announced that doctors should offer safe alternatives to homeopathic teething tablets and gels. 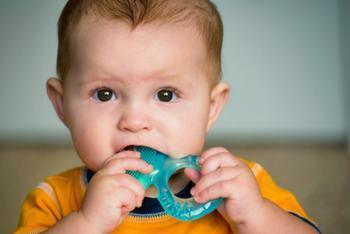 “Teething can be managed without prescription or over-the-counter remedies,” Janet Woodcock, MD, director of the FDA’s Center for Drug Evaluation and Research, said in a statement. William Wathen, DMD, an associate professor at the Texas A&M University College of Dentistry, agrees. Wathen recently shared some helpful tips that may help parents and caregivers wade through the teething stage without pain relievers, tablets, or gels. Echoing Woodcock’s statement, Wathen said that using pain relievers to treat teething discomfort is usually unnecessary. “I do not suggest giving them pain relievers,” Wathen said. “Just remember that teething is a normal event, and if baby has discomfort, it is mild and temporary.” He added that teething gels should also be avoided as they may contain benzocaine -- an ingredient which can be harmful to babies if swallowed. Instead of using pain relievers or teething gels, Wathen encourages parents to turn to natural remedies when their baby is teething and fussy. A plain, solid teething ring will allow babies to apply pressure to ease the pain on their own, he said. Chilling the teething ring is fine, but parents shouldn’t offer their children a completely frozen ring. A go-to soothing method for many parents of teething tots is to massage their child’s gums with a clean finger or washcloth. For this to be effective, Wathen says parents will need to be tuned in to their children and be prepared for some give-and-take. “Your baby may want more pressure or less pressure, so it’ll take a lot of experimenting to see what works and which areas of the gums are most sensitive,” he said. Another form of relief may already be sitting in parents’ refrigerators. If you’ve already begun introducing solid food to your baby, Wathen says cold applesauce or yogurt can often help take away some of the discomfort of teething.